If that potential threat looms, it hasn’t slowed these media companies from dramatically expanding their local television holdings in recent years. A decade ago, the number of stations owned by what are now the five largest local TV companies was 190. Today, that number is 464. In 2013, alone, about 300 full-power local TV stations changed hands, at a cost of more than $8 billion. That is 195 more stations sold than in 2012 and more than four times the dollar value of the deals made in 2012. The FCC recently tightened its rules concerning ownership of multiple stations in the same market. But, much consolidation has already occurred. As of today, five companies own one-third of the about 1,400 local TV stations in the country. Here’s how they amassed their local television empires, while in some cases, unloading their newspaper holdings—a sure sign that Aereo or not, local television is considered a far healthier business than the newspaper industry. Sinclair Broadcast Group, based in Hunt Valley, Maryland, and now the largest local television station owner in the country, purchased 63 stations in 2013, including seven from Allbritton Communications and 22 from Fisher Communications. If all pending sales go through, Sinclair will own, operate or provide services to 167 television stations in 77 markets, reaching almost 40% of the U.S. population. Nexstar Broadcasting, headquartered in Irving, Texas, has grown its portfolio to 108 stations in 56 markets—a 140% increase from the number of stations it owned in 2004. In March 2014, Nexstar completed the acquisition of three stations from Citadel Communications for $88 million, while last month the FCC approved its purchase of five stations in Colorado and Florida. The company’s acquisition of another 29 stations, deals that were announced in 2013, is pending before the FCC. Media General, based in Richmond, Virginia, once owned scores of newspapers. But in 2012, the company sold all of its papers (63 dailies and weeklies) to World Media Enterprises, Inc., a subsidiary of Berkshire Hathaway, Inc., for $142 million. And Media General has doubled down on its local station holdings, announcing plans in March 2014 to buy LIN Media’s 43 stations for $1.6 billion. Gray Television was once part of a newspaper company called Gray Communications Systems. But it spun off those five dailies into another company in 2002. 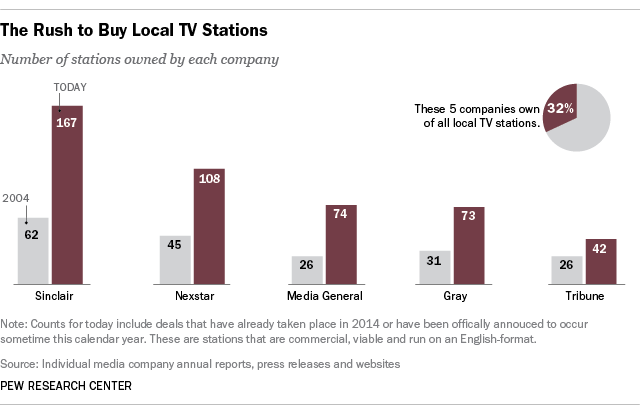 In the past decade, Gray Television has more than doubled the stations it owns—now just one behind Media General at 73. In November 2013, Gray Television announced the purchase of Yellowstone Holdings’ four stations for $23 million. The Tribune Co., based in Chicago, emerged from bankruptcy in December 2012, and then made the richest single deal in 2013, spending $2.73 billion to acquire 19 stations from Local TV Holdings. Tribune is another media company that is bullish on television and more bearish on newspapers. The company has put all eight of its newspapers up for sale, but after failing to fetch an offer, it now plans to spin them off into a separate company.